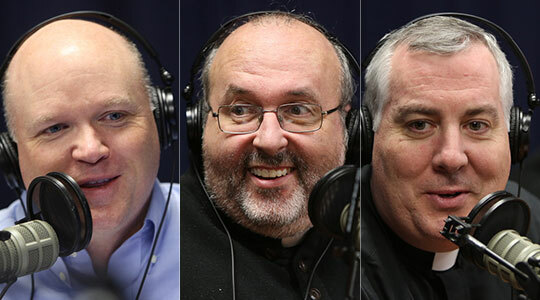 Summary of today’s show: The new pastoral plan for the Archdiocese of Boston, Disciples in Mission, is one of the biggest commitments in this or any American diocese to a New Evangelization, and Scot Landry and Fr. Mark O’Connell talk with the man whose job will be its implementation, Fr. Paul Soper. The ambitious plan unveiled yesterday depends on a belief in the following statement in Fr. Soper’s words: “Parish-based evangelization works and we can train for it, but we need strong parishes in order to do that.” Our panel goes into depth on just what that means including the millions of dollars and thousands of hours committed to training of thousands of Catholics for that New Evangelization to leave a stronger Church for our children and grandchildren in the decades to come. 1st segment: Scot Landry said it’s the last full work week in November and he’s looking forward to Thanksgiving next week. Yesterday we had big news at the press conference in which Cardinal Sean announced the new pastoral plan for the archdiocese. Fr. Mark O’Connell said he’s very proud of his best friend, Fr. Paul Soper, who was appointed director of pastoral planning. Scot said there were hundreds watching via live video stream, and thousands listening during a simulcast on WQOM. Scot noted that the Cheverus Awards will be this Sunday at 3pm at Holy Cross Cathedral and will be broadcast live on CatholicTV. It recognizes people who have faithfully served their parishes with little recognition. People are welcome to attend or watch if they can’t be there. Another note is that this weekend is the second collection for the retired religious sisters at all Masses. He noted that religious sisters have made a tremendous impact on all of us on our whole archdiocese and all of us individually. Scot also welcomed into the studio today Gina Zanicky, who is the Director of Radio Production at the Station of the Cross network based out of Buffalo. 2nd segment: Scot welcomed Fr. Paul Soper back to the show. He said it’s been quite a week and he’s humbled by the Cardinal’s trust in him asking him to spearhead the office of pastoral planning. Scot said there was a very big national search for the director but they settled on Fr. Soper because of the way he handled the office in the interim period and a very challenging period. Scot noted that Fr. Paul’s current assignment at St. Albert in Weymouth is going to end because of the demands on his time from this new job. Fr. Soper said he finds it difficult to leave parish life and particularly St. Albert’s which has been very kind to him, especially since when he arrived he was recovering from illness. Fr. Mark said the people at St. Albert’s did a great job nursing him back to health and perhaps to good a job because he’s now healthy enough to lead this huge new effort. Scot asked Fr. Paul what it is that made him place such an importance on being involved in the pastoral planning consultation process. Fr. Paul said he was impressed by the effort to bring so many people together and he liked the idea of getting so many people involved in setting the future direction of the Archdiocese. He’s also someone who loves to work with data and computer systems as someone who is trained as an astrophysicist. Fr. Mark noted that Fr. Paul continues to publish scientific papers as a scientist and has a great brain for computer systems and statistics. Scot said in his background as a marketer he learned that any change must be first preceded by collection of data and analysis. Fr. Paul said a large part of his job will ongoing evaluations of the implementation of the pastoral plan in collaboratives and that means a lot of data will need to be collected and designing the tools to collect that data will be important. One of the parts of the plan that changed based on the collection of data from the consultations was the assignment of pastors. Originally every pastor was going to change so there wouldn’t be winners and losers in the collaboratives, but the people said they trusted their pastors to be fair even if he was previously pastor of one of the other parishes in the collaborative. Another element that emerged from consultation was the emphasis on the collaboratives developing pastoral plans based on the local situation. Scot said most of the headlines in the news got yesterday’s press conference wrong, referring to the pastoral plan as reshuffling, reorganization, restructuring, revitalization. Scot wouldn’t have picked any of those verbs. Fr. Paul said he would have picked revitalization. He said Cardinal Sean used very strong words to commit to this pastoral plan. The commitment to Disciples in Mission is a commitment to evangelization. Scot said to him it’s a reallocation of resources to serve the existing parish structures we have, mainly human resources. He emphasized that this is not church closings. Fr. Paul said it’s not principally about reorganization. His short explanation is this: Parish-based evangelization works and we can train for it, but we need strong parishes in order to do that. the radical things in this plan include the training. What diocese has committed millions of dollars to training pastors and lay leadership to do the work of evangelization. Parishes will be evaluating themselves going forward in a commitment to their pastoral plans. Scot said the reporters got the content of their articles correct, but one of the challenges is that the trends on Mass attendance aren’t going well across the country. Yet, the plan has built in the hope that the plan will work and in decades we’ll look back at the decision not to close parishes as a smart one because we won’t have to re-build new churches. The hardest phase starts now. The consultation phase was fruitful, but implementation is even harder. What happens next? Fr. Paul said Phase 1 is only 10 percent of the collaboratives. It’s a sandbox or a beta test. Fr. Paul admitted that he and Fr. Mark have played the World of Warcraft video game and he talked about how the developer asked 10 percent of players to try out a new expansion pack before releasing it to all players. They would rewrite the program as they got feedback and by the time it was released to everyone it was in much better shape. Scot noted that a world-class piece of software is iterated along the way. Phase 1 provides some learning before we implement in the whole archdiocese. Fr. Paul said we know what 70% of the 130 pastoral collaboratives will be already. Next week, parishes will receive letters on what the collaboratives will be and they will be asked to confirm those groupings and to say whether they are willing to be part of Phase 1. In January they will list the names of the collaboratives in Phase 1. He said in some case, parishes have been working collaboratively for a while and are anxious for the training that will be made available. In other cases, they want to have an impact on the way that the plan is implemented overall. Fr. Mark asked if there are cases where parishes will be asked to be part of phase 1 even they say they’re don’t want to be. Fr. Paul said it could happen because Phase 1 has to be representative of the whole archdiocese: urban, rural, ethnically diverse parishes, parishes that are well-off, parishes that are struggling and at least one collaborative that will be a standalone parish. Phase 1 will surface as many of the issues as possible so they can develop responses to them. Fr. Mark said this is how they implemented the Improved Financial Relationship Model. Scot said pastors in that process had agreed that we needed to make the financial structures more sustainable for parishes for their evangelization efforts. Pastors now serving multiple parishes with multiple parish councils with multiple staffs say it isn’t sustainable. It’s not more effective to have three youth ministers, say, when you could have one of them doing adult faith formation and the third doing ministry to the very young, perhaps. Fr. Paul said some of the more eager phase 1 collaboratives are in that situation. Fr. Paul said on January 16, 2013, stage 1 training will begin for all employees of central ministries of the archdiocese. It will be eight days of training: four days in leadership management, 2 days in theology and practice of the new evangelization, and 2 days in practice of collaboration. Scot said the idea is to develop skills in change management, to learn what the new evangelization is, and how to foster a more collaborative working environment. All these changes require new skills we haven’t had before. Fr. Paul said it’s also an example of leading the way. The people of the parishes are going to be making an extraordinary commitment to training and the Pastoral Center should be leading the way on that. Pastors will have 50 days of training over 18 months. In May 2013, Stage 2 will be for the Phase 1 pastors for eight days spread out over 4 weeks on the same topics. Once the phase 1 collaboratives are announced, each of the parishes will be treated by the clergy personnel board will be treated as open. Current pastors can apply as well as other priests. The idea is to be totally fair and transparent. The pastors will be announced in early March 2013. Scot said each pastor named will almost certainly be someone who applied for that job. Scot said after the training ends in June 2013, the pastors hire pastoral staff. The collaboratives start July 2013 and over the summer the pastor pulls together the team and councils. In September, the pastoral councils, finance councils, and school boards will receive training. There will be one council of each kind per collaborative and each school will have on board. The pastoral team trainings will start in September. October has the most intensive portion of the training and last for four months. There will be 16 days of training in each collaborative in their own site. That is for the pastoral team. Some will be daytime, some nights and weekends. For the leadership and management portion of the training, they are engaging the Catholic Leadership Institute. The evangelization portion will be done by a team being formed by Bishop Arthur Kennedy. The mechanics of collaboration training will be done by Pastoral Center staff. In late January 2014, the pastor will have chosen a team of 6 to 8 people to write their local pastoral plan and that’s the final stage of training as they get eight days in training for this. They will have a year to write this plan. They expect it be consultative and they will ask phase 1 to be very transparent in the process because other collaboratives will benefit later on. Phase 2 will be much larger with about 50 collaboratives and they will take two years. This begins in July 2014. Phases 3 and 4 will follow on, with 50 in phase 3 and 20 or so in phase 4. From Phase 2 onward they will have case studies of other collaboratives. Scot said Cardinal Sean called the process organic and flexible. Fr. Paul said in forming the groups themselves, the list has changed a lot and is very different from the list from this past January. And going forward, because we’re not closing parishes and we have some flexibility, we could react to what happens by saying that maybe we need to shift the collaboratives or break some of them up. There could be demographic shifts and the needs of people could change over time. Scot said we end the liturgical year next Sunday and at the end of the year we’re taken to the last things, the return of Christ. Many people fear that day. Fr. Paul said he fears that day, but it’s not the only feeling he has about it. Christ has told us what to do and when we’re standing there before him we’ll be confronted with whether we’ve done what he asked. But he also looks forward to seeing him. We can be joyful in anticipation of Christ. Scot said not knowing the hour can be a great spiritual help because it can encourage us to be ready and go to confession today or go to Mass more and pray more. Fr. Mark said Jesus is also saying we shouldn’t have an irrational fear because no one knows the day or hour. People try to scare others that the world is ending, but Jesus is saying we should relax and find comfort in knowing he will be in command. There’s a balance between comfort but also a sense of getting ready. Fr. Paul said St. Mark is writing for a community under awful persecution and the message in this Gospel is to hang in there because it’s going to be okay. Scot said he’s not sure we focus enough on these readings in all the rush of Thanksgiving and encouraged listeners to spend more time focusing on them.